EDITOR’S NOTE: Updated at 5:30 p.m. EDT (2130 GMT) with NOAA statement. The 229-foot-tall (70-meter) Falcon 9 rocket lifted off at 7:13:51 a.m. PDT (10:13:51 a.m. EDT; 1413:51 GMT) Friday after a smooth countdown. Nine Merlin 1D engines on the Falcon 9’s reused first stage booster throttled up to full power, putting out 1.7 million pounds of thrust as the rocket turned southward from the military spaceport on California’s Central Coast northwest of Los Angeles. After exceeding the speed of sound, the Falcon 9’s first stage shut down and jettisoned around two-and-a-half minutes later. The booster dropped away to conduct experimental descent maneuvers, but SpaceX did not try to recover the rocket intact on Friday’s mission. SpaceX is disposing of its reused older-generation rockets — like the one launched Friday — as an uprated Falcon 9 version called “Block 5” is set to debut next month. The Block 5 configuration’s first stage is designed more multiple reuses. The Falcon 9’s single Merlin upper stage engine lit two times during Friday’s flight, pushing the 10 Iridium satellites toward a circular orbit targeted around 388 miles (625 kilometers) above Earth. In a secondary objective, SpaceX recovery crews tried to retrieve part of the Falcon 9’s payload fairing with a fast-moving vessel in the Pacific Ocean, but the experiment ran into trouble, according to Elon Musk, the company’s billionaire founder and CEO. The fairing recovery boat, named Mr. Steven, is outfitted with a net — or “catcher’s mitt” — to catch the shroud as it descends slowly under a steerable parafoil guided by GPS navigation signals. On Friday’s flight, SpaceX wanted to get back one half of the fairing, a bulbous nose cone which jettisoned in two segments around three-and-a-half-minutes after liftoff. The aerodynamic fairing covers the sensitive satellites during final launch preps and the first phase of the flight. But Musk wrote on Twitter that the fairing’s parafoil became twisted, and it hit the Pacific Ocean at high speed. SpaceX wants to eventually recover and reuse payload fairings like it does first stage boosters. On the last fairing catch attempt, the shroud splashed down intact a few hundred meters from Mr. Steven. But engineers want to catch the fairing before it hits the ocean to minimize refurbishment from contamination by seawater. Mr. Steven is currently based at the Port of Los Angeles, so SpaceX’s fairing recovery experiments are limited — for now — to launches from California. SpaceX ended its live webcast unusually early due to what the company’s launch commentator said were restrictions from NOAA on imagery from the Falcon 9’s upper stage. 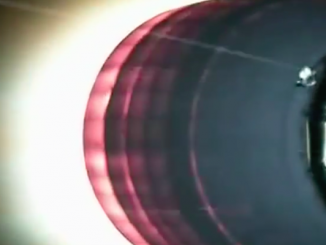 During most SpaceX missions, on-board cameras beam back live views of engine burns and deployment events. NOAA is in charge of regulating remote sensing cameras that view Earth from space, such as high-resolution commercial reconnaissance satellites capable of monitoring global military movements, spotting cars and ships, and tracking other activities. But “rocketcams” like those used on missions by SpaceX, United Launch Alliance and other companies are not so eagle-eyed. SpaceX said NOAA recently asserted that cameras on the second stage, used for engineering purposes, qualify as a “remote sensing space system,” placing the cameras within the government’s regulatory reach. 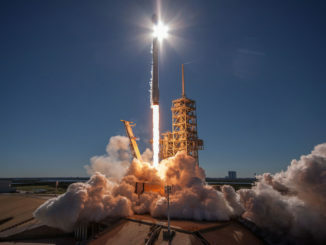 A provisional license obtained by SpaceX for the launch prohibited the company from airing views from the second stage once on orbit, the company said. SpaceX does not expect this restriction remain in effect once the company obtains a full license. No such imagery limitations are expected during the next Falcon 9 flight, scheduled for Monday from Cape Canaveral, SpaceX said. Under NOAA’s guidelines, small, hand-held cameras are not supposed to be considered remote sensing space systems, and should be exempt the regulations. “The National and Commercial Space Program Act requires a commercial remote sensing license for companies having the capacity to take an image of Earth while on orbit,” NOAA said in a statement. “Now that launch companies are putting video cameras on stage 2 rockets that reach an on-orbit status, all such launches will be held to the requirements of the law and its conditions. “SpaceX applied and received a license from NOAA that included conditions on their capability to live-stream from space. Conditions on Earth imaging to protect national security are common to all licenses for launches with on-orbit capabilities,” NOAA said. On-board cameras made a splash last month during the maiden flight of SpaceX’s Falcon Heavy rocket. SpaceX’s cameras returned spectacular, widely-shared imagery of a spacesuit-wearing dummy Musk nicknamed “Starman” that launched on the Falcon Heavy, riding in the driver’s seat of Musk’s Tesla sports car. The video blackout had no impact on the mission, and the Falcon 9’s upper stage engine successfully guided the 10 Iridium payloads into orbit, deploying the satellites one-at-a-time around an hour after liftoff. 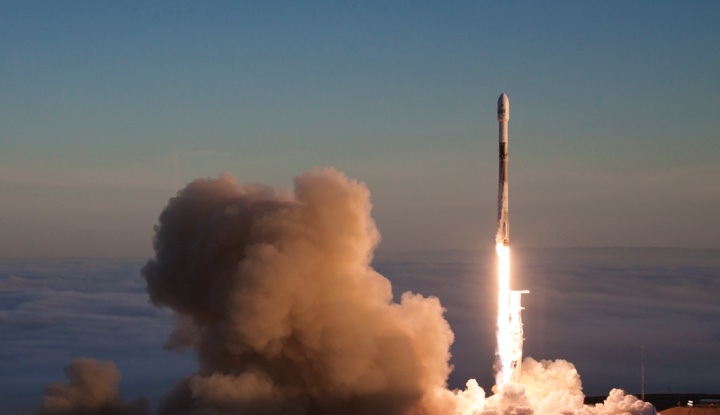 Iridium officials said all 10 satellites — each with sophisticated L-band and Ka-band radios and antennas, plus aircraft and ship tracking equipment — were healthy following Friday’s launch. The spacecraft will replace 10 aging satellites in Iridium’s network, which recently surpassed a million subscribers. With Friday’s mission, the Iridium kicked off the second half of its eight-launch campaign with SpaceX. Four previous missions — in January, June, October and December 2017 — each delivered 10 Iridium Next satellites to orbit. Iridium ordered 81 new satellites from a Thales Alenia Space/Orbital ATK industrial team to refresh the company’s communications fleet, which provides message, data and voice communications worldwide. Iridium’s old satellites launched in the late 1990s and early 2000s, and are now functioning well beyond their planned seven-year missions. The modernized satellites — the centerpiece of a $3 billion upgrade investment — will ensure Iridium’s subscribers have uninterrupted telephone service, even outside of cellular range, and they also enable higher-speed applications, such as broadband connectivity for video and data transmissions. SpaceX is under contract to launch 75 of the satellites. Sixty-six are needed for Iridium’s full network, and another nine will serve as spares. 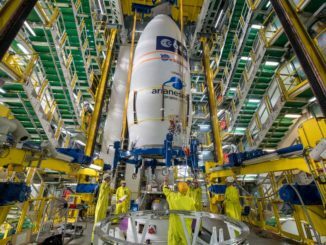 The six remaining satellites will remain on the ground for now for a potential launch to replenish the constellation in the future. 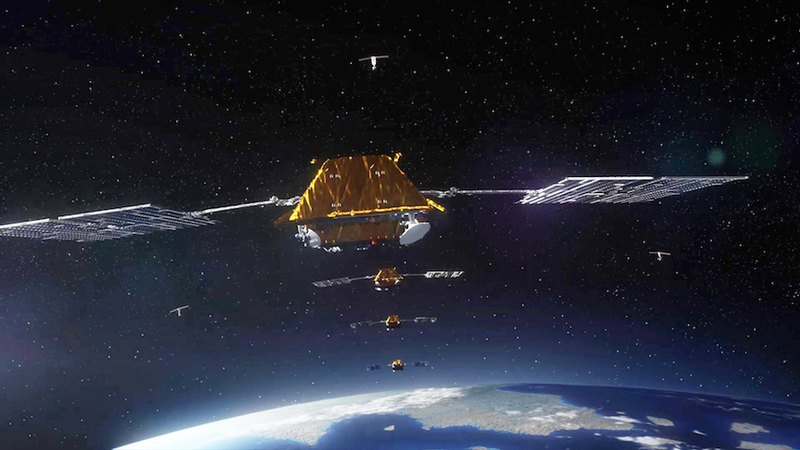 “Two-thirds of our satellites are now in orbit and performance is exceeding expectations,” said Denis Allard, vice president of constellations for Thales Alenia Space. Iridium expects the 10 satellites launched Friday to boost themselves into higher orbits around 484 miles (780 kilometers) in altitude over the next few weeks. They will take positions near the old satellites, allowing ground controllers to switch the network to the upgraded spacecraft one-by-one over the next 30 days, Iridium said. Desch said in an interview before Friday’s launch that he was satisfied by the pace of satellite deployments achieved since the campaign began in January 2017. “It’s meeting our needs,” Desch said. “We really are focused on completing our Iridium Next constellation this year. I’d like it completed in the third quarter if possible. What I’m really pleased with is that SpaceX has stepped up this year so far. “Unlike last year, where we might have been waiting for SpaceX, I think this year I’m trying to make sure my suppliers are delivering fast enough to go as quickly as possible,” he said. Iridium says more than half of its 66-satellite network is now populated with Iridium Next satellites. “If you look at the service, every customer is getting a new satellite about 60 percent of the time, so it’s already over half of the time that they’re getting service from the new satellites, just by the way that the beams lay down,” Desch said. A new broadband service powered by the Iridium Next satellites, known as Iridium Certus, will begin commercial operations in mid-2018, Desch said. The L-band broadband service will reach users on the land, at sea and in the air, and testing of ground terminals is well underway. Each Iridium Next satellite also hosts an aircraft tracking transceiver built by Harris Corp. The air traffic monitoring project, led by an Iridium affiliate named Aireon, will become operational once at least 66 Iridium Next spacecraft are in space. The 10 spacecraft launched Friday also carry ship tracking antennas for exactEarth, a Canadian company. Engineers are deactivating Iridium’s retiring satellites, built by Lockheed Martin, as the new relay stations arrive in orbit. Most of the old satellites will be maneuvered out of orbit to fall back into Earth’s atmosphere, and the others will undergo a procedure known as “passivation,” in which their batteries and propellant tanks are drained, rendering them inert and reducing the chance of an explosion in the future. Iridium flares, a popular phenomena for sky-watchers over the last 20 years, will end when the last of the old satellites is retired. The Lockheed Martin-built Iridium satellites have silver-coated Teflon antennas that behave like mirrors, reflecting sunlight down to Earth just before sunrise and just after sunset. The flares are predictable — to the second — and the satellite briefly becomes one of the brightest objects in the night sky. Sky-watching apps and websites can provide the times of upcoming Iridium flares anywhere in the world. The Iridium Next satellites designed by Thales Alenia Space have a different antenna shape that does not produce flares. “The era is unfortunately coming to an end one of these days,” Desch said. The last predictable Iridium flare will likely occur in late 2018 or early 2019. Three more Iridium satellite launches are planned by SpaceX, with the next one in May. SpaceX’s next Falcon 9 launch is set for 4:30 p.m. EDT (2030 GMT) Monday from pad 40 at Cape Canaveral Air Force Station. A Dragon cargo craft packed with several tons of supplies and experiments for the International Space Station will ride the Falcon 9 into orbit.